Long-distance driving in the early days of the automobile was no joke. This fact is conveyed in indelible fashion by the text of an unattributed diary acquired by the Libraries in 2012, whose entries describe a 1920 auto trip from Long Beach, California to Chagrin Falls, Ohio. Despite an exponential growth in car sales in the 1910s, and the annual publication of a route guide called The Official Automobile Blue Book, trips still proceeded from point to point on local, often unpaved and unidentified roads. Rain and mud limited travel, and snow precluded it. 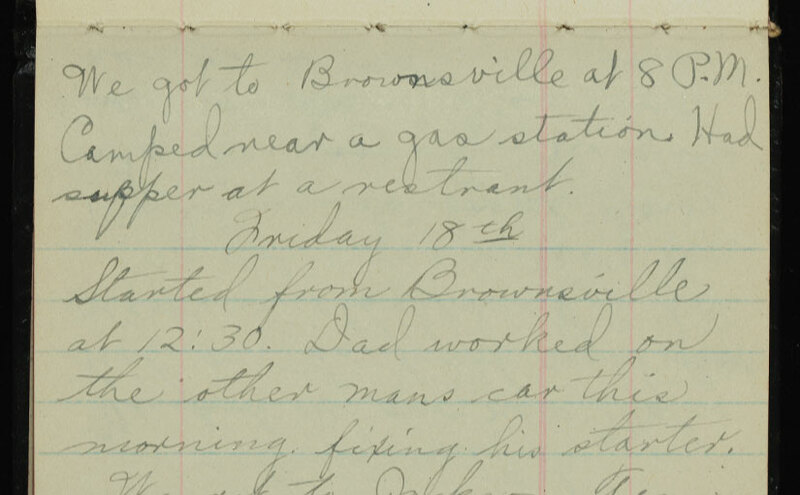 Thursday [October] 14th … Got off road to Niland [California]. We went up a sandy mountain & thru revines on low mostly. About 50 miles bad road all up grade. We struck civilization just before dusk. We sure was glad to see some one. We went 100 miles and never saw a dwelling. Sand and more sand. We camped beside a well all alone near a store. Nor was food always readily available; sometimes “Dad” went hunting for birds and rabbits. Frequent tire punctures and breakdowns came to a head in Hot Springs, New Mexico (“the worst city in the world I believe by a dam site”), where the family was forced to remain for a week. Sometimes they took a break to enjoy local sights, but mostly the schedule called for day after day on the road. Just like travelers on the Oregon Trail, cars welcomed the company of other vehicles, for companionship and safety and for help with the inevitable breakdowns. Expense accounts in the diary indicate that in their first month of travel the family spent around $150.00. Gas seems to have run about 40 cents per gallon. On one occasion the author notes progress of 185 miles in a day, but this was certainly exceptional. It has rained all day. About 12 miles from Cleveland the darned tire had another puncture. Just got out of the main part of Cleveland & the front left tire went down. Before we got to Lorain the front left tire blew out. Dad said let it go so we drove on it & the left hind tire punctured so we took it off & went on the rim. We got stuck in the mud in Chagrin Falls & walked a couple blocks to Aunt Eustella’s at 10:30 P.M. In the 20s the government sought to rationalize long-distance auto travel with the introduction of the U.S. Highway System; by late 1926, our travelers might have followed Route 66 from Los Angeles to Chicago. The 50s saw the development of the Interstates. But in 1920, the amenities offered by modern highways were few and far between.